As someone who has battled her thick, curly, frizzy, disaster-area hair for all her life, I’ve learned a thing or two about the proverbial “good hair day.” And while I enjoy spending time doing my makeup, my hair is another story. My hair probably spends an estimated 350 days a year in a high bun (usually in a slightly purposefully messy “I woke up like this” style). However, in recent months I’ve been making slightly more of an effort to tame the beast, and I’ve learned a few things along the way. Embrace your natural texture. We all want what we don’t have, but I’ve learned that working with, instead of against, what you’ve got works out better in the long run. Way back in the day (ahem, middle school) I used to straighten my hair every day. Wanna know how to fry long, thick hair? Turn your straightener up all the way and iron it like it’s your job. Now I’m on the other side of the spectrum, and didn’t think twice about leaving my heat-styling tools at home when I left for Australia. Product is your friend. I don’t remember where I read/heard that you can use more than one product at once, but that was a game changer. To this day I’m not sure why I didn’t think you could layer products… For me and my non-heat styling lifestyle, products help me tame the frizz and enhance the curls. My hair tends to frizz as the day goes on, and I have yet to find a fool-proof all day product, but they certainly help. My go-to is actually just coconut oil (just don’t use too much, or your hair will look greasy). Pro tip: don’t mix up your products; the above picture is what happens when you confuse your dry shampoo with your hairspray. Not pretty. Find your overnight tricks. My hair is glorious after some solid hours in an ballet bun or two French braids, but unless I want to rock a Shirley Temple vibe, I skip the curlers. As someone with thick hair, I also have to make sure my hair is damp enough to hold the style come morning, but not too wet, or it’ll still be near-dripping when I take out the braids (and then all it’s going to do is frizz). Dirty hair is good hair. I do that whole “no shampooing” thing. For those who aren’t familiar, it doesn’t mean I don’t wash my hair (because, ew) but that I condition every day and only shampoo every two or so days. The natural oil keeps the frizz down and allows my hair to chill out a bit. I use a clarifying shampoo, which really cleans your hair (I don’t recommend it for every day shampooing, though), and a dry shampoo on the days I skip. Learn from your hair icons. Find someone with similar hair to yours that rocks it and take notes. Even if your hair is more problematic than theirs, they can be a go-to for product recommendations and handy tricks. My friend Natalie’s hair is somewhat like mine (thick, curly) and like me she doesn’t tend to heat-style. Girl has gorgeous, natural, stay-all-day hair with volume Beyonce would envy. I still don’t know her secret, but damn if I don’t interrogate her for tips and sneak a look in her shower when I’m at her place (sorry Natalie). 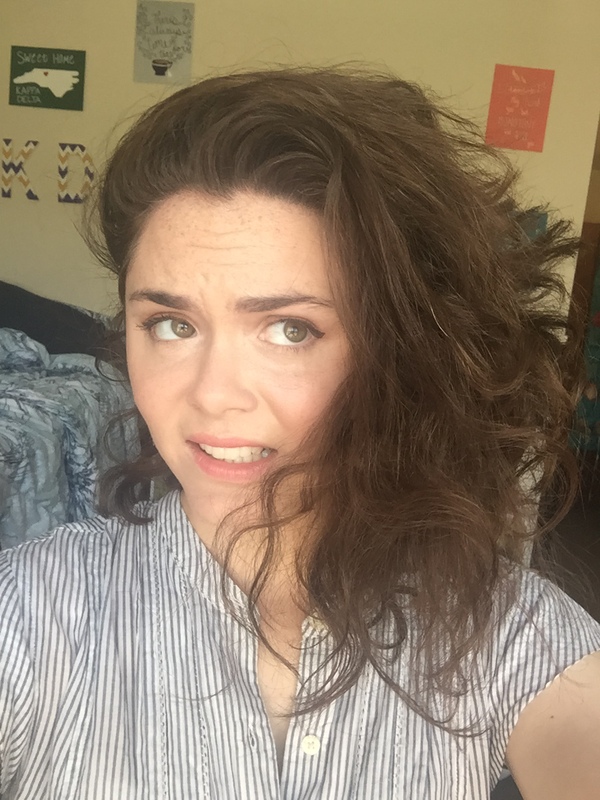 I’m all about the no-effort hair tricks, so anyone got some I missed? So true! But your hair is always on point, Kathleen! Styling my hair frustrates me so much, I just am out of ideas! This post helped a lot!